I really like this Sheltering Tree stamp set from Stampin’ Up. It’s just so versatile and can be stamped for any season. This time I stamped it with Fall colors, but here I stamped it in lovely green tones. Both cards are made with a simple stamped panel layered to coordinating card stock and then layered onto a card. The tree is stamped with brown ink on white card stock with the branches barely coming off the left side of the panel. The leaves on the tree are stamped twice; once with terra cotta ink and once with cranberry ink. The grass is sponged with olive ink and then lightly sponged with a darker ivy color to create some dimension. The sky is sponged with light blue ink using a cloud template. (You can also punch a scalloped circle and sponge over the edge of the circle for a cloud template.) The leaves on the ground are stamped with the same terra cotta and cranberry inks. The swing is stamped with brown ink. Finally, the sentiment is stamped with brown ink. The entire panel is layered to cranberry card stock and then attached to a kraft card. 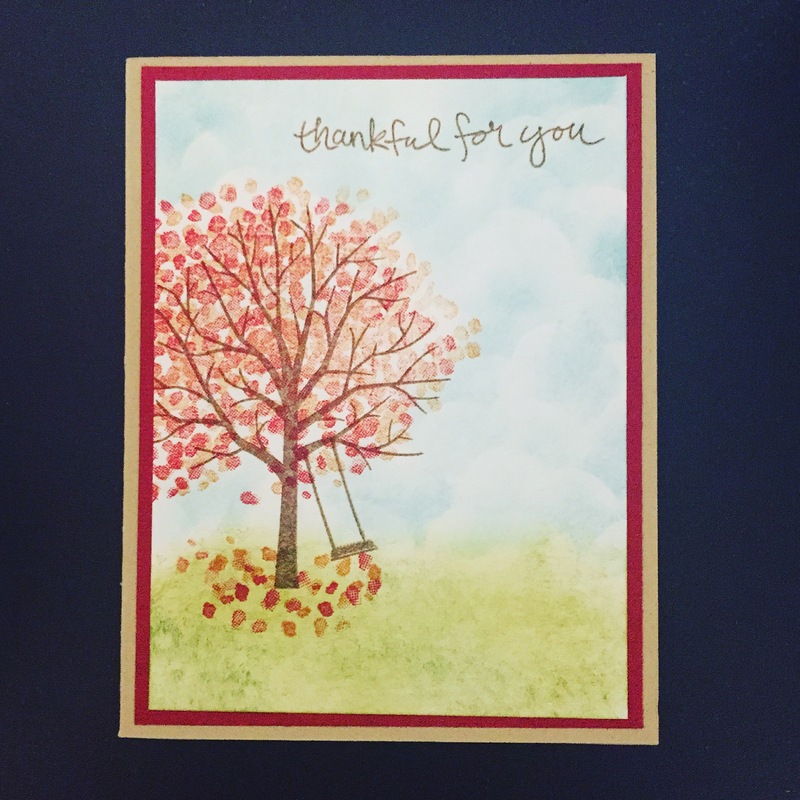 This card can be used as a thank you card, thinking of you card, or it would also make a great Thanksgiving card.